I will just go straight to the point, because making a will keeps many quite busy. It is not necessary to make a Turkish will when you want to leave your property (house etc) to your partner and children. The Turkish law already provides this automatically. If one of the spouses passes away, the property will be inherited by the longest living spouse and the children, or in case there is no spouse by the children all together. It is a waste of time and money to still make a Turkish will when that is not necessary, even more when you already have a will in your own country. On the other hand it is wise to make a will in case there are no children, when there is a kind of partnership that is not legally acknowledged by Turkey (like a partnership agreement) or in case of donations to third persons who are no legal inheritors of the testator. The longest living spouse can not be disinherited, but children can be disinherited. The legitimate portion of the child is half of the legal inheritance. When you for whatever reason decide to make a will, you have the right to use one or more executers. An executor is a person (it does not have to be an inheritor) who is appointed to execute the will (the final testament) of the testator. Herewith the executor has all the necessary powers to execute the will. 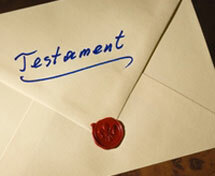 On behalf of the inheritor the executor is empowered to request a certificate of inheritance by the Turkish court. This will save the inheritors, who do not know the system of Turkey, a lot of time and money. The executor has the right to resign from his duties. He only has to inform the local cantonal judge. In case he has started his duties, he can not resign just like that. At any time the cantonal judge can call the executor to account. After reviewing it will be published.